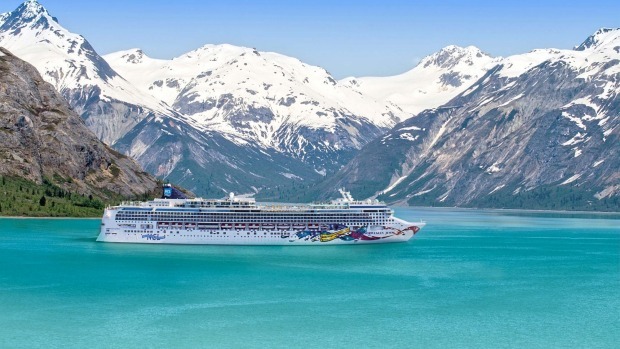 The Norwegian Jewel is the first cruise ship I have ever set foot on, so during a five-day repositioning from Vancouver to Los Angeles, I find I have to recalibrate many of my initial impressions. For instance, the size of the 2376- passenger vessel is overwhelming at first but a day later I can navigate its 10 public decks with some competence, and two days later I am already nodding at a few familiar faces. Conversely, it takes me a while to fully appreciate the spaciousness of my suite. I have a balcony penthouse in The Haven, the ship-within-a-ship on the Jewel's top floor. (The fancy rooms, as one young lady stage whispers to her friend as we share an elevator ride one night. The lift, always slow, seemed at that moment to be moving at the speed of a retreating glacier.) At a generous 440 square feet, or about 40 square metres, penthouses like mine are the most modest accommodations in The Haven. There are also two and three-bedroom villas, the largest of which are small palaces replete with entrance halls, grand pianos and walk-in wardrobes. 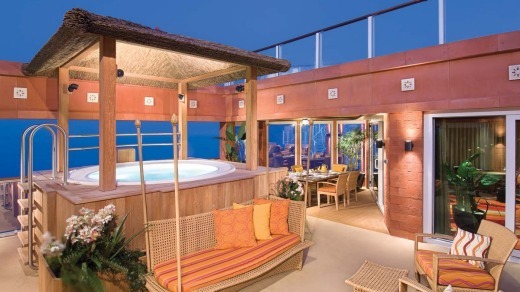 Norwegian Jewel - three-bedroom Garden Villa Patio with private hottub. The Haven's suites are arranged around a skylighted courtyard with a private pool, spa and gym. 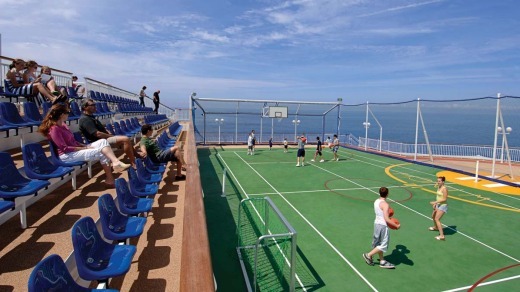 On this cruise, the latter is roundly ignored by all. Instead we spend much of our time eating, which can be done almost anywhere at any time, a hallmark of Norwegian's signature "freestyle cruising". Passengers have 14 restaurants available to them as well as round-the-clock room service – a dangerous luxury on a ship with nine bars. Since I'm travelling alone I am doubly enabled and so I indulge in desserts at midnight, secure in the knowledge that my butler will never judge me. Norwegian is counting on its flexible "you do you" cruise style to give it an edge next year when it deploys the Jewel to Australia. The ship will be based in Sydney from November 2017 to February 2018, when she'll undertake a series of sailings around Australia and New Zealand. Menus will be regionalised – which hopefully means more authentic Asian food than the Americanised dishes they were serving on the other side of the Pacific – and so will the entertainment, which includes dance show Burn the Floor. The floor most likely to be burnt is that of the thousand-seat Stardust Theatre, the jewel of the Jewel's night-time offerings. On this cruise, the theatre hosts stand-up comedy, comedy-juggling, a musical and a cirque-musical, bolstered by live music in the bars and lounges. An unplanned highlight comes in the form of some fellow passengers, a group of mostly Maori high schoolers from Bay of Islands College in New Zealand. They're on a cultural tour and request permission to perform in the Stardust Theatre, where they do themselves proud showcasing traditional Maori song and dance. The North American crowd loves them. A handful of male audience members even join them on stage and attempt the haka. The Stardust puts on two shows a night, but if you miss the curtain the ship is big enough that there's always somewhere else to go. Most evenings I wander between the decks as if channel surfing, alternating between amusingly tuneless karaoke, an excellent jazz quartet, and people-watching from my perch at the bar. At one point I spend the length of a glass of wine observing a 90th-birthday celebration. The lady of the hour is outdancing her extended progeny, shaking her nonagenarian rump to covers of pop songs. The Jewel is imminently well suited to an intergenerational group such as this. With her multitudinous offerings – kids club, tennis courts, spa treatments – she's a real crowd-pleaser. After 10pm the entertainment options dwindle somewhat. The casino is still a hive of fluorescent activity, but I don't gamble and there's only so long you can watch someone else play blackjack. I'm also not too keen on the smell – along with the cigar lounge, it's one of the few indoor venues where smoking is allowed. The other late-night option is the Spinnaker Lounge, the cheesy-but-fun nightclub whose dated decor somehow survived the ship's 2014 refurbishment. Here the DJ plays chart hits too old to be current but not old enough to be vintage, the soundtrack equivalent of a pair of knee-high gladiator sandals. The Spinnaker Lounge hosts the biggest party of the cruise, the White Hot Party, for which the UV lights are switched on and glow sticks are distributed. The crowd, thematically attired, looks like phosphorescent plankton. High-energy crew members direct our dancing, making us face the same direction and gallop in unison to Gangnam Style. The whole thing is terrifically corny and we all embrace it, diligently obliging whenever the song compels us to throw our hands in the air, jump around or get low. On port days when we pampered passengers have the chance to be independent for a few hours, many of us shy away from the logistical hassles of being a tourist by staying on the ship or paying for organised shore excursions. In Victoria, B.C., I take a two-hour whale-watching boat ride that costs the equivalent of five hours of Wi-Fi, the only resource that's in scarce supply on a cruise. It's worth it: we spot a pod of orca, a humpback whale, a herd of sea lions and a ridiculously adorable sea otter floating lazily on his back after gorging on seafood. But when we dock in Astoria, Oregon, the next day, there are no shore excursions that will take me where I want to go. My destination is the Lewis and Clark National Historic Park, a gorgeous swath of sitka spruce forest where the Columbia River meets the Pacific ocean. It's also where the Lewis and Clark expedition, commissioned by Thomas Jefferson to explore the western frontier, discovered it had travelled so far west that it had run out of America to explore. Ready to strike out on my own expedition, I step off the gangplank and ask one of the ground crew how to get to the park's visitors centre. "Do you want to go on an excursion?" "No, I want to go on a hike." Pause. "Well, aren't you energetic?" Sensing I have committed some subtle cruising transgression, I practise "just relax"-ing on the two remaining sea days. The Jewel turns out to be well equipped for inactivity. My Italian-made mattress is so comfortable that I have no trouble sleeping through breakfast, which I needn't wake up for any way because I can have breakfast delivered to my room. By the last day I am so thoroughly chilled out that I spend an hour or two – I'm now too relaxed to keep track of time – sipping champagne in the bathtub, half-watching a movie and half- reflecting on the cruise. Faced with an abundance of activities and limited time, I did what I always do when I travel: as much as humanly possible. In a handful of days I had managed to sample much of what the Jewel has to offer. But in doing so I had nearly overlooked that most quintessential of cruise pastimes: doing sweet bugger all. The Norwegian Jewel will transfer to Australia in November 2017 to undertake 15 itineraries in Australia, New Zealand, Asia and the South Pacific. Fares start from $787 per person twin share for a five-day Tasmania voyage from November 12, 2017. For more information about its itinerary and bookings see a licensed travel agent, visit ncl.com.au or call Norwegian Cruise Line on 1300 255 200.